This dish is perfect for the whole family! Easy prep, low carb, and kids love it!! -Brown the ground turkey on stove top. -Remove squash from microwave, slice in half, scoop out seeds and throw away. -Take a fork and "shread" the squash into a bowl. -Combine all ingredients leaving 1/2 of the cheese out. Stir well. 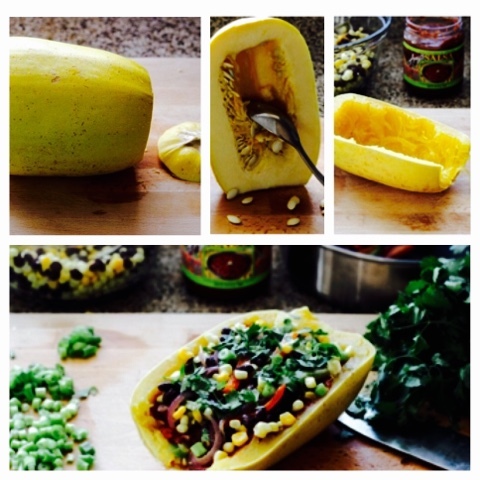 -Spoon into empty Spaghetti Squash Bowls, Top with cheese. -You can customize each bowl to your families desires! Add sour cream, chives, salsa, jalapeños, guacamole on top. This dish is guaranteed to be a hit for the whole family!